Since 1992, Northern Iron and Machine has held ISO 9001 certification for its foundry and machining operations. More recently, the company was awarded Transportation and Power Generation Certification (TPG) for its iron casting processes. As part of these quality management systems, Northern Iron and Machine monitors size, soundness, hardness, and general workmanship using the following important processes and techniques. During the initial production run of iron castings produced from a new pattern, Northern Iron and Machine performs a full dimensional layout. After a part enters into production, it is dimensionally verified based on the pattern’s cycle count which is a measure of molds produced on a given pattern. This dimensional verification of the casting is done to monitor tooling wear. Also, during the initial sampling phase, the casting process is further developed and verified thru soundness evaluation by either sectioning or radiographic examination. We section a part by sawing it in a variety of orientations through the thicker cross sections of the casting. Every heat lot is checked for hardness using a Brinell hardness tester. The hardness value is used as a process control parameter that closely follows the mechanical properties of the material. The hardness readings are recorded into our internal metallurgical software system for thorough evaluation. 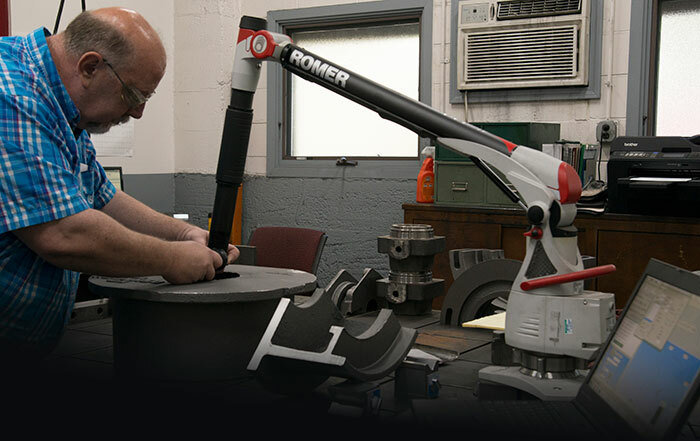 In addition to a complete range of manual inspection tools, Northern Iron and Machine uses a Romer arm for the precise measurement of all finished iron castings. The Romer Arm is a manually operated coordinate measuring machine. It is accurate within thousandths of an inch ensuring final iron castings meet quality requirements.